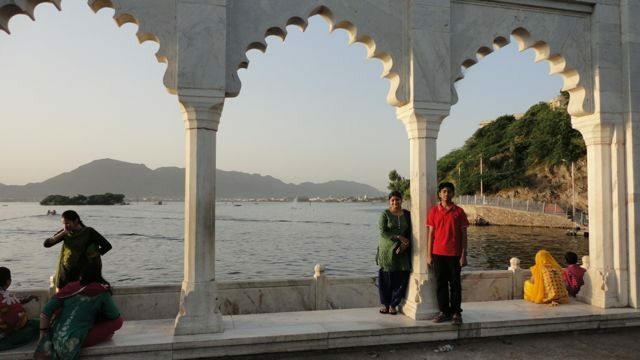 Anasagar Lake, Ajmer, Rajasthan - Ghumakkar - Inspiring travel experiences. 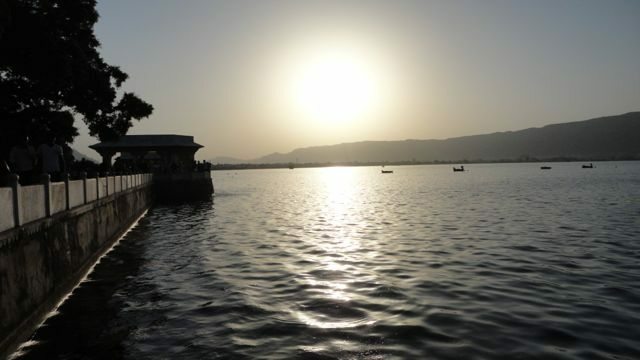 “Anasagar Lake” at Ajmer is an artificial lake, built by Anaji Chauhan, grandfather of Prithvi Raj Chauhan in 1135-1150 AD. Many of the roads within the city of Ajmer pass by the banks of Anasagar lake and people can see the lake from those roads. The most important place, however, was the “Baradari”, built by Mughal Emperor, Shahjahan, on the banks of this enormous lake. So, after having a banta-drink at Soni Ji Ki Nasiyan, we went near a Hanuman Temple, called as “Bajrang Garh”. It was situated on the top of one small hillock. From that place, one had to walk for about hundred meters to go the banks. A very spacious, but paid parking, was maintained there by the Ajmer Municipality where we parked our car and walked down to the lake. 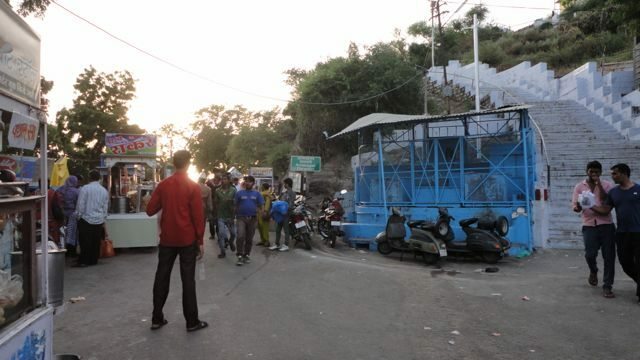 The road was lined with stalls selling various street foods of Ajmer. But we observed that except for some minor variations in the recipe, the stalls were selling common items of the street foods that are generally available everywhere these days. So, even though we were a little hungry, we decided to first see the lake and stop at those stalls later. When we reached the lake, it was around 5 pm in the evening. The sun was setting. It was a perfect time to be on this lake. People from all walks of life were having the pleasure of sitting and walking on the garden or on the banks. The reflections on the surface of the water were creating a mesmerizing spells. We stood motionless for some time and admired the beauty of the nature. The silhouette against the setting sun was absolutely picturesque. I felt that sometimes, cameras cannot capture the real beauty and colourful display of the nature. As we came near the banks, we saw people throwing bread-crumbs, rice flakes and other edible items into the lake. Immediately, we guessed the presence of fish in the lake. 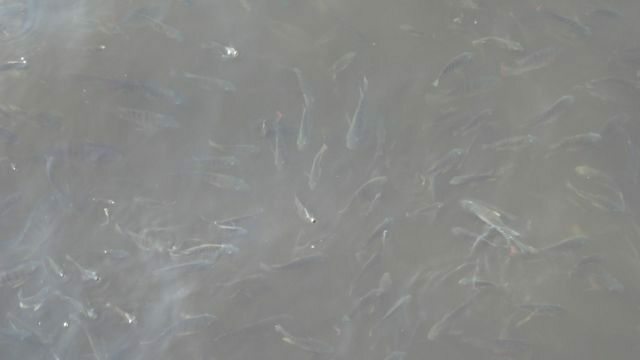 There was a very large school of fish. I did not know which or how many breeds of the fish were prevalent there. They were competing with each other to grab the edibles. A big slice of bread or even an entire packet of bread was disappearing in less than a minute. But, let me also share that people also get naughty and throw plastic bottles, pan-gutka etc into the water. Such acts take away the beauty of the lake. The waste materials thrown by people near the baradaris were also an eyesore. Mughal Emperor Shahjahan was a regular visitor at Ajmer. In 1637 AD, he got constructed five baradaris on the bank of this lake. All the baradaris are made of finest marbles. The first two baradaris were identical and face each other. They were smaller in size too. However, waste materials thrown by people near those baradaris were an eyesore. The third one was really magnificent. It was a replica of Deewane-khas of the Red Fort in Delhi. 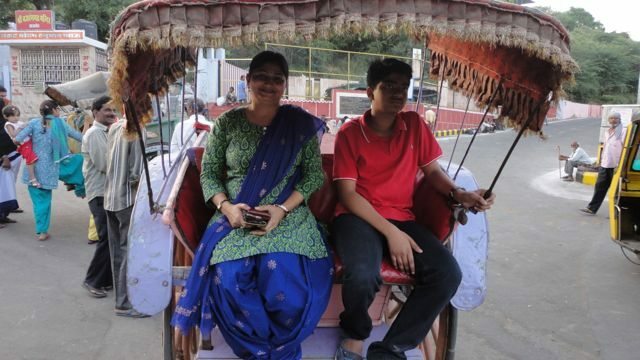 We walked towards the third baradari and spent the maximum time there. The columns and the arches were beautifully crafted. It would be very easy to imagine the beauty of this place during 1640s, when the air was not polluted and the people dare not throw anything into the water. With vegetation around and with lesser number of people, the lake would have resembled the “Jannat on earth”. It was a real oasis. The forth baradari was smaller than the third. My son Ruchir, by that time, became in his elements. His comments, when he was in a good mood, were full of laughter and mirth. Suddenly, I saw an old aged person, selling the “desi sohan-papdi”. He was carrying those sweets in a very small basket that could stock hardly 100 small pieces. I was wondering how those small road-side businessmen sustain their families with so meagre income. The age of that man was also on the higher side, which clearly indicated his lack of social security. Curious to know more about his reasons for continuing with his business instead of retiring or resting, I went near him. I was thinking that his would be again a similar tale of children not caring about their parents in their old age. But the old man was very proud of his state. He chose to come to those banks every day and to be useful for the family and society. While I was talking to him, the aroma of those sweet “sohan papdis” was also filling my nostrils. Finally, I was tempted and bought four pieces at the paltry sum of 10/-. 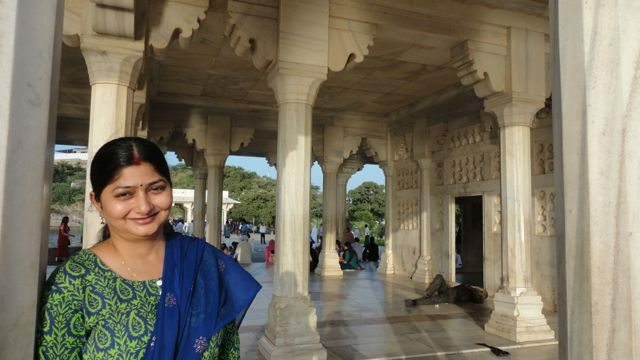 At that time, a small group of young children was sitting on the banks of the lake and singing a “quwwali” in the name of Khwaja Moinuddin Chisti alias Garib Nawaj. One of the child was really good in raising up the tune. In that sublime environment, eating those delicious sohan-papdi and listening to the public performance of those young children, was a very pleasant experience. In those splendid moments, we forgot to see that the sun was setting at Ajmer. Anasagar lake would soon go to sleep. Fish that swim in daylight would go to their hiding place and the water-kingdom of this lake would be taken over by the fish that swim during night. So, hurriedly we came to the fifth baradari. The sun-rays falling on the fifth baradari were giving it a golden hue. The fifth baradari was like a three-gateway. I stood at a little distance from this baradari. The Aravalli ranges visible in the far end, water in the middle and the baradari on the banks were producing a very decent look. Past that baradari, a jetty had been constructed. We were not interested in boating that day so we watched from the sidelines. The boats were ferrying people to an island in the middle of the lake and coming back to the jetty. The evening was growing darker. Soon those boats would take their last sail of the day. 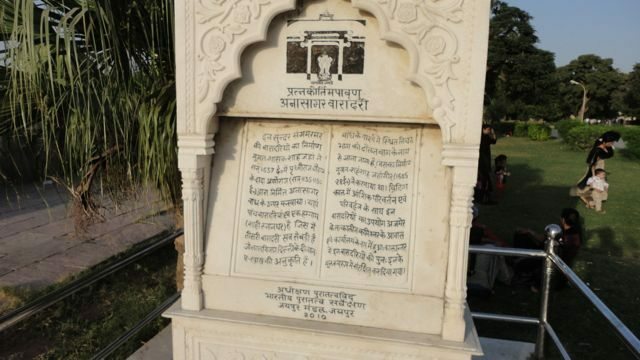 The archeological survey of India had placed a marble plaque there. It was informing the history of that place. I was really surprised to know that the British used these baradaris as their administrative offices and residences. Really, they must have enjoyed their India posting to the fullest. 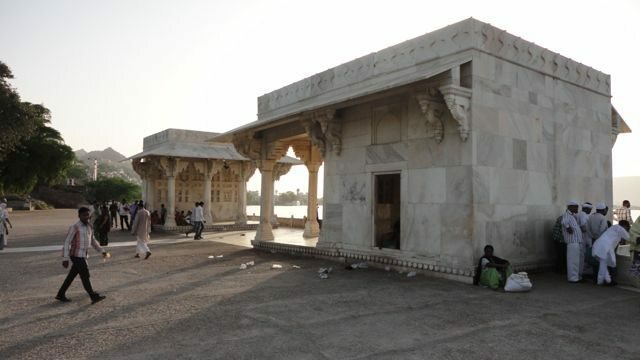 The “Daulat bagh” built by Emperor Jahangir on the banks of the lake was in poor shape. Why do we throw our wastage in open, especially in the heritage properties? Anyway, it was used as a good place for a day out by the local populace. Another awesome sight was the presence of “White eastern Egret” birds. These birds were returning to their resting place on the trees. I am not a bird-watcher. 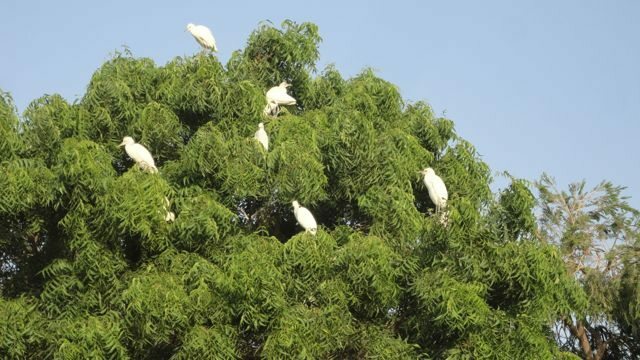 But it was really a treat to watch lots of large Egrets on the branches of the trees in the Daulat Bagh. 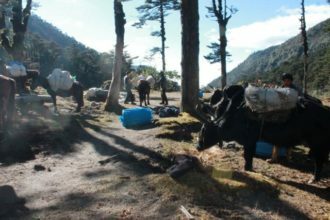 When we came out of the Anasagar lake, it was a perfect time for an evening snack. The street food stalls, that we had avoided so far, ultimately dragged us into their charm. As I said earlier, things were all the same, with minor variations in recipe and name. For example, “Gol gappe or Pani-puri” is named as “pani-patashe”. 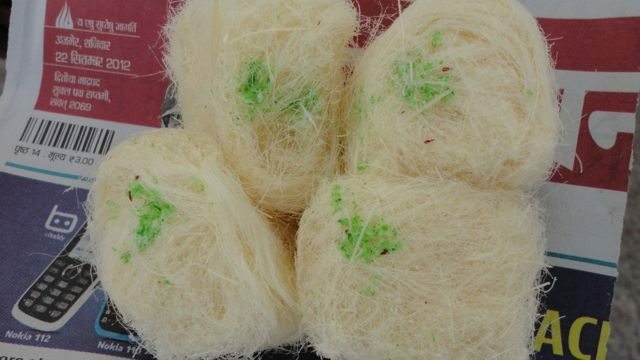 The ingredients of the pani-patashe also included “Sev-daal” along with normal aloo-kabuli etc. The items were of general use and not extra-ordinary. Except for the experimentation, those should not be recommended for their taste. Listening to the stories connected with an altogether different profession, we reached in front of the “Delhi Gate”. From there, we would go to the “Dargah of Moinuddin Chisti” on foot. Working with Government and presently posted at Mumbai. I like to explore the cities. I wish to see various cities in India till my last days. Nice post, well written and good pics too! Glad that you liked the post. Nice post Uday Bhai. A unknown place to me until this post. Your photo is missing in all post. any specific reason ? Thanks for your comment. Glad that you liked the post. I believe that is a super detailed log on this lake, almost a guided walking tour. Thank you Uday for the treat. Thangsing is guarded by Pandim on one side and a swift river flows noisily close by. One flank of the mighty Kanchenjungha shone brightly ahead of the path towards Goechala. Thangsing easily qualifies as the best spot enroute to Goechala Pass.